Inground pool waterfalls aren’t cheap. But if having a posh and scenic pool is one of your top priorities, then you may want to find room in your budget. Nothing can do more to add a sense of luxury than one of these babies. Combined with some creative landscaping, a waterfall can transform a backyard pool into a sliver of paradise. A waterfall not only makes your pool easier on the eyes, but the ears as well. The peaceful sound of water falling provides a comforting backdrop when you’re reading or just relaxing by the pool. Waterfalls come in a lot of different varieties, and costs vary substantially depending on the material used and the difficulty of installation. However, for most inground pool waterfalls, you will pay $1000 and up. 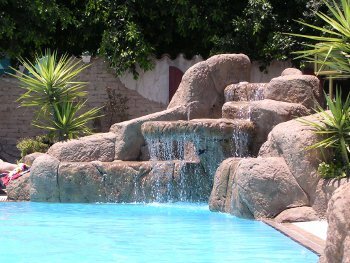 Waterfalls are generally designed to last for the lifetime of the pool, if not longer. Pool waterfalls may be pricey, but they’re built to last. Do you want a natural-looking rock formation, or some other sort of structure? Will a pre-made waterfall suit your needs, or do you want something custom-made? Do you prefer the water to fall down as a sheet (less sound), or cascade down different surfaces (more sound)? If you get a rock formation, do you want it to include a cave or seating? Regardless of whether you get a custom waterfall or a kit that can be assembled, you will need professional installation. You don’t necessarily have to find someone with waterfall installation experience, but you will need someone who knows basic masonry. Installation usually takes a day or two. Waterfalls come in many styles, including sleek and modern looks such as this. To many, inground pool waterfalls are an extravagance. But then, so are inground pools themselves, when you think about it. It all depends on what your goals are. If you want a swimming pool that is as enjoyable to look at as it is to swim in, then you can easily justify the additional cost. Keep in mind, too, that a waterfall is more likely to actually add value to your home than many other optional pool features. Rather than take out a large pool loan, many homeowners forgo vacations in order to pay for a new inground pool. More than any other decoration or landscaping feature, a swimming pool waterfall actually makes your backyard seem like a vacation destination. If you’re looking for a way to rationalize the expense, there you go.